In HP, Rahul Gandhi hits Modi where it hurts most: growth in Jay Shah’s business. 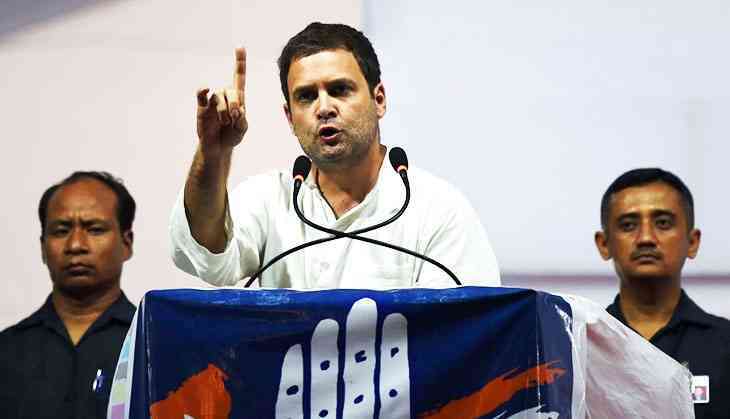 After Prime Minister Narendra Modi's whirlwind tour of poll-bound Himachal Pradesh, Congress vice-president Rahul Gandhi held rallies in the hilly state and launched a scathing attack on the prime minister. While addressing a rally in Paonta Sahib in Sirmour district, the Gandhi scion accused the prime minister of maintaining an eerie silence on the phenomenal rise in the fortunes of BJP President Amit Shah's son's company after the saffron party came to power. “Modiji comes here and talks about corruption but doesn't utter a word about BJP President Amit Shah's son Jay Shah. There must a lot of small businessmen here. Please tell me whether there is anyone who can turn Rs 50,000 to Rs 80 crore in three months? Is there anyone who can increase his income within few month by 16 thousand times? Shah zada can eat but Modiji wouldn't utter a single word,” Gandhi said. Continuing his attack on the government's twin policy decisions of demonetisation and GST, Gandhi mentioned how these decisions have killed India's growth story with GDP growth falling by 2%. He pointed at how businesses have been destroyed by GST and claimed that if voted to power, Congress would bring major changes to suit the needs of small and medium businesses. Responding to Modi's jibes of Congress being synonymous with corruption and how the party siphoned off Rs 57,000 crore in subsidy meant for the poor, Gandhi said, “Vyapam scandal takes place in Madhya Pradesh and 50 people die. The entire education system is sold but Narendra Modi doesn't say a word about Vyapam. Everyone knows about Parkash Singh Badal's record on corruption but Modiji doesn't say a word,” he said. Questioning Modi's development model, Gandhi mentioned how the UPA government had allotted Rs 35,000 crore for MGNREGA. “However, Modi government gave this money to rescue big companies. What kind of development is this?” he asked. Meanwhile, ahead of the GST Council meeting, finance ministers of Congress-ruled states launched an offensive against the government seeking nothing less than a major overhauling of the tax regime. Calling it a big disappointment, finance ministers from Punjab, Karnataka and Puducherry claimed that GST has turned the clock back by a few decades. “It is surely a case of poor implementation on all fronts: concept, design, tax rates, exemptions, compliance requirement and technological preparedness. As a result there is mammoth confusion all around, with harassed taxpayers running for cover, government going for quick fixes in the wake of forthcoming elections, and the business community nearly unanimous that the government has frittered away a huge opportunity with non-seriousness and ill-preparedness matched only by excessive sloganeering,” read a statement released by these ministers. Punjab's Finance Minister Manpreet Badal, who had earlier claimed that the government has finally started paying heed to the demands of the Opposition after Yashwant Sinha's criticism, said, “The present GST system will make us tread the path of ruin, not resurgence. Unless it is amended, India can’t be a superpower. Congress' single rate GST was an opportunity. BJP mutilated GST and with it caused economic crisis,” he said. Seeking a simplified GST, he added how four months ago the ruling party told Congress that not a comma within GST would be changed. “However, Gujarat elections changed that,” he said. Meanwhile, Krishna Byre Gowda, Karnataka's Finance Minister raised the issue of GST Network and claimed that they were informed how GST would lead to GDP growth of 2%. “Much the opposite happened five months after BJP's mismanagement,” he said. These ministers highlighted how Indian GST rate is the highest in the world despite the fact that most countries start with uniform GST rate of a single digit or at the most below 15% or at worst 18-20%. They pointed that government’s own CEA advocated a mean tax rate of 15.5% or at most two rates, with higher not exceeding 18%. According to them, the government has jettisoned the report of its own advisor and gone for GST rates of 50% that are unheard of anywhere except on goods like tobacco and alcohol. In order to gain maximum political mileage over GST, the grand old party will field former Prime Minister Manmohan Singh for a one-day campaign in Gujarat where he is likely to speak about the ill-effects of GST and demonetisation. Moreover, Gandhi will resume his Gujarat campaign from 11 November and will visit north Gujarat for a three-day campaign which will begin from Gandhinagar. Meanwhile, hoping for a Gujarat like response from people of Himachal Pradesh over GST, the Congress vice president continued to attack the prime minister over what he refers to as Gabbar Singh Tax. Only time will tell whether an attack on GST will cut much ice with people of the hilly state as much as it did with the Gujaratis. For now, Congress seems to be on a sticky wicket in Himachal with BJP clearly leading the race. TWEET THIS ‘Modiji comes to HP and talks about corruption. Why’s he silent on Jay Shah?’: @OfficeOfRG asks In HP, Rahul Gandhi hits Modi where it hurts most: growth in Jay Shah’s business.